Recent data on core inflation, unemployment claims, and stalled job growth show a slowing US economy. The current weakness is expected to reverse soon, with US economic activity powering up global economic this summer. The Fed is expected to leave interest rates alone and as the housing market returns to health, the path to improved retail sales growth and consumer confidence is more certain. With US energy output so strong, OPEC is unable to push oil prices up. That dampening helps to keep inflation under control and energy dollars kept in the US. Much lower home prices could unleash latent demand by July and encourage builders to start construction again. The nation’s hottest market, San Francisco has seen huge drops in prices and sales, drops not really supported by economic facts. With buyers saving every month, they will have better buying power by July and sales should grow. Right now is the best time to buy a home. The US economy in 4th quarter, grew at its fastest rate since 2015. Business spending rose and with recent positive jobs report (304,000 new jobs in January doubling forecast of 165,000, with 175,000 reported temporarily laid off, and wage earnings up 3%), and moderating interest rates, the outlook is rosy. 4th Quarter US GDP growth came in at 2.6%, well above economists forecast of 2.2%. Non-residential investment jumped up 6.2%. R&D spending which often foretells future growth, rose a surprising 9.9%. 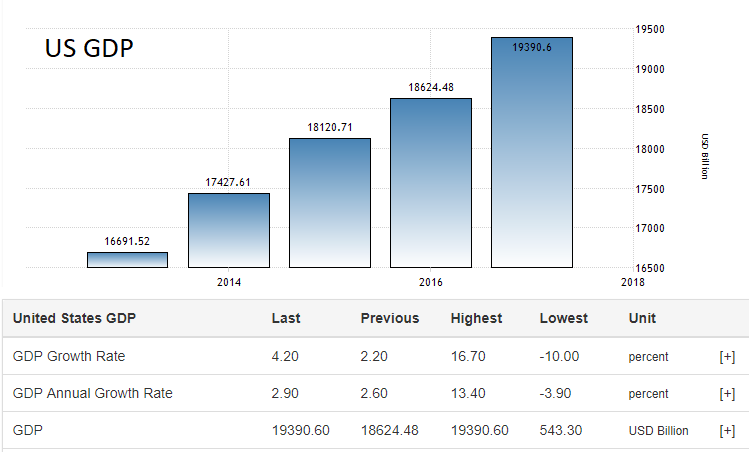 The full year GDP growth was an impressive 3.1%. While jobs and investment soar, housing remains a drag on the economy with a retraction of 2.6%. If global growth should become an issue, housing may be the President’s Trump card over the Democrats. The good news today should pick up new housing starts. Small business is enjoying a phenomenal resurgence in America. Graduates, real estate investors, startup entrepreneurs, US stock investors and mom and pop business owners have never seen it this positive. And in the housing market too. In 2019, businesses may see the role of real estate economics, as President Trump looks to neglected areas to ease the housing crisis issue and stimulate the economy. Housing plays a key role in economic growth and continuous neglect creates huge drag. 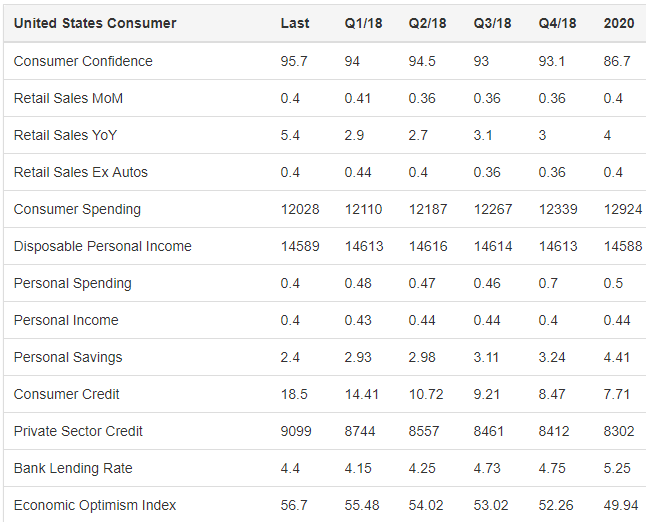 Please enjoy all of the data, charts and insight below, and please do bookmark this page for updates, and share on Facebook. “As small businesses across the country make up 99.7% of all U.S. employers and 64% of net new private-sector jobs, they truly are the backbone of the country’s economy and an aggregate indicator of its health and status” — from Fundera Report on the Booming Economy. US GDP growth for 3rd quarter 2018 came in at 3.4%. With tariff protection, business confidence, and strong consumer wealth, big housing market demand, 2019 and 2020 GDP growth could surpass any experts predictions, far from the negative predictions of some. Although Democrat media will never report on US economic recovery, booming job growth and economic growth in the heartland show the US is recovering from Free Trade. Along with booming 4.2% GDP growth, record low unemployment, rewarding career opportunities in high wage jobs, wage increases of 3.1%, we’ll soon see the real economic boosting effects of import tariffs, tax cuts, and US IP protection. It’s a good time to buy a house or condo, a new car, start a family, or take a vacation. Up till now, it was all theory. The negatives? Not much right now, except for Fed Chair Jerome Powell who actually warns about a slowing economy and the need to raise interest rates?? And he warns about the damaging effects of the government shut down while acknowledging that previous shutdowns had no effect on the economy. With US businesses again flourishing due to the protective tariffs, we’ll see more investment in US firms and rising wages in America. Then rising interest rates might make sense. Why the Big Optimism About the Economy? US GDP is expected to grow strong through 2020. Optimism in business is high. The Wells Fargo Small Business Index hit a record high at +136, the highest in its 15 year history. The only thing bothering business these days is fewer talent available. That means even with the Democrats intent of reversing “America First” back to foreign production, the US is seated strong for years to come. The next 2 years of US manufacturing development will strengthen American competitiveness for years to come. The US dollar will strengthen, stock markets will adjust, and it’s fun time ahead for Americans. The lagging housing market and small business sector should regain their stride once multinationals are forced to build factories in the US (Jan 1st, the 25% import tariff took effect. No free access for China is expected). The coming 10% tax break for the middle class makes 2019 look very good. Multinational corporate stock market performance (NASDAQ, DOW, S&P and TSX) may see some further corrections as imports from cheap labor pools into the US dwindle. 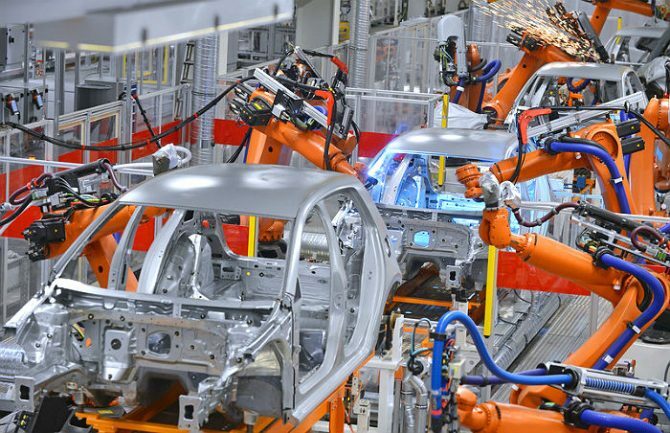 The benefits of reducing the trade deficit by $300 Billion per year and the creation of new US factories is making Americans more confident of their long term future. That will spawn optimism that we haven’t seen since the 1960’s. And the benefits will spill over into Canada and Mexico, regardless of trade agreements. Despite the short term volatility and negative stock market predictions, the US economy will grow. With inflation reported this month at 2.4%, there is little reason for the Fed chairman to raise interest rates. And government hasn’t been adding much to the economy anyway. The figure below supports the optimistic picture for the US economy. US consumers are spending, it will be a great Xmas season, and they’ll keep spending even more in the next 4 years. If companies are forced to set up operations in the US, creating better higher paying jobs, and the trade deficit is cut, the US economy could grow much further. It’s a great time to invest in US SMB’s and startups. What this report translates to is stronger employment security, prime market access for US companies, better housing, more opportunities for young people with big student loans, returning entrepreneurial spirit, higher pay soon, and hope for a poverty/housing plagued nation for many years ahead. Wage growth is coming once business must return operations to the US. Trumps tariffs won’t take full effect until Jan 1st 2019. Deloitte just produced their outlook which is ridiculously negative and politically biased. Somehow, they forecast a recession. Some pray for a housing crash, but it won’t happen. Too much demand from optimistic US Millennials. Deloitte does admit however, that if the Trump strategy doesn’t work, the US can always change course and ease its trade rules. It’s a no lose situation for the US. And so far, multinational corporate profits haven’t been affected. In fact, with small business America decimated, these companies have no competition and are thus reaping ridiculous profits. While the Democrats are crying and pushing the doomsday button via media, the US economic growth continues at an astonishing rate. And while multinationals still resist creating plants in the US, the pressure is building on them, and they’re missing out on potentially even more lucrative US markets — to wiser and new competition. Sticking with China is an increasingly losing proposition, as China begins to turn in on itself. The US economic prediction is that the US is about to enjoy the same growth and opportunity that spawned the China revolution. High employment, new career opportunities, optimism, imagination, confidence, and hopefully soon, higher wages as newly created US firms begin to thrive and capitalize on a wealthy American consumer market. New business formation was at its lowest in history when Trump was voted in. Since then it has risen, and with rising tariffs, lower regulation, and continuing low interest rates, the stage is set for an entrepreneurial boom in the US. Reports say stimulus withdrawal and waning consumer confidence will end it all. Yet stats show strong consumer confidence and evidence that consumers are ignoring politically biased noise in the media. Financial experts on Bloomberg were hinting at another potential 10 years of boom times in the US. President Trump met with the EU President to announce the elimination of tariffs however they and the Chinese are too heavily invested in their own market protection schemes. There won’t be a deal. 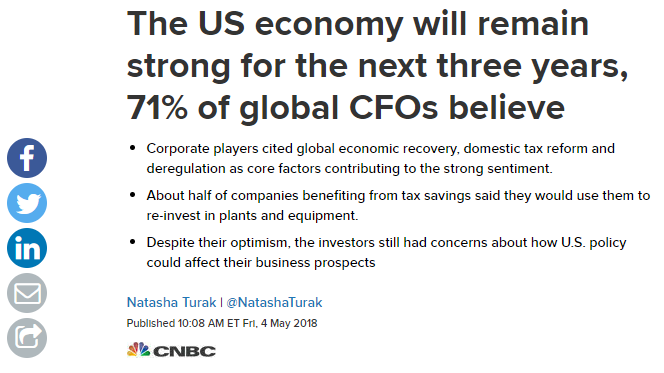 That spells good news for the US economy. With manufacturing returning, US oil production growing, low corporate taxes continuing, business regulation dismantled, the macroeconomics for the United States is as good as it has ever been. 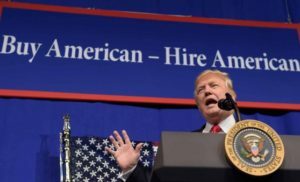 Economic Boom: The US import tariffs will help to give US businesses a strong startup environment against huge foreign companies who benefit from ultra-cheap labor. Intellectual property protection means US companies won’t see their own work exploited for free by competitors. This is a huge change. See more of the numbers below. Oil production, manufacturing, housing construction, and technology startups in the US haven’t even hit their stride yet. And while economic turbulence may cause discomfort, Americans should continue to enjoy years of strong growth and prosperity and to solve the affordable housing crisis and avoid any housing crashes in some cities. This 2018 to 2020 US economic expansion is controlled, lower risk, and more sustainable. Voices have tried to talk down the new US economic revolution, but they’re growing weak against a clear voice of confidence in America. If China can sustain 10% growth, the US can manage 3% to 5% growth just fine. An endless array of economists, billionaires, millionaires, stock experts, and democrats are promising a big US economic recession within a couple of years. They cite statistics, history, tradition, and trade impasses that will ruin the party. In lieu of real economic performance statistics, consumers and voters are ignoring the dour outlook. The US economy looks unusually solid, not a bear or a bull, but more like a Rhinoceros. While some belicose doomsday sayers tout their complaints, they themselves keep pulling in higher profits from their US stock portfolios. Laughably ridiculous. There are some exciting new statistics from housing to manufacturing to new business formation that bolsters a happy sustained outlook. US manufacturing jobs were decimated as we all know, and as these jobs in modern manufacturing return, the economy will boom and wages will rise. Consumers are not fulfilled and production capacity will grow. The talk of embargos on US goods are overstated for sure. Resentment from Europe, Japan, Canada, and Mexico will subside. US manufacturing output will grow in quality and the world will want US products. Who wouldn’t want reciprocal access to the US market? American consumers are expecting good things. They’ll buy any house they can get their hands on and they won’t be buying as many Toyotas, Mercedes Benz and Beemers as before. Fords, Chevys and Tesla’s will be in good demand. Trading economics forecasted 93.1 consumer confidence rating for fall 2018. It’s actually at 100.8 despite all the political and trade volatility. The end of Free Trade was predictable. American poverty, debt, and misery and lack of control has brought it to a stop. Fair Trade will be the new norm. Free Trade wreaked havoc on American lifestyle, wealth, politics, and optimism. It was a concept for the 80’s, but it’s not the 80’s anymore. It has ruined people’s lives. The stock markets continue their happy upward direction. A US housing crash is unlikely and the stock market looks pretty healthy. However, a global recession would affect the US as would a China collapse. President Trump knows it, which is why he keeps pulling back on 100% commitment to many of the policies he sets forth. Housing starts keep growing as depicted below, and with demographics so positive (Millennials and Gen Z’s coming soon), the demand will be steep. It’s a fantastic time to be in US real estate. Post Free Trade: Do the Old Stats Really Forecast the Future? Are old stats valid as predictors, or is the disappearing influence of foreign nations and internatioal corporations going to create a while new playing field? Even with Artificial intelligence processing, can the old data really tell us what a post Free Trade America looks like? That data is getting a little dusty already. Score one for human brain power and imagination. The new economic data shows how this 2018 to 2024 economic boom will transform US culture. We haven’t seen this situation since the 1960’s. We’ll witness a nation of financially disabled, overweight, stressed out, drug-induced, tatooed, metal pierced, gender identity confused, NIMBY protestors jump back to one of certainty, confidence, and self-esteem. It’s this matter of self-esteem of the American people that’s so critical. CNN and other media paparazzi think esteem is something dished out in scathing news reports. But what’s happening is a nation’s self-esteem is being regained and this time innoculated against media manipulation (the Media and big advertisers don’t like that). Can Anything Stop This Incredible American Economic Boom? A first thought many of us have is that the US economy is too strong to stop – a new economic locomotive with momentum. It’s partly powered by the relief of decades of economic evil and by the old belief (babyboomers) that the US should be strong and independent. Some have felt Asia should lead the world. There’s something extremely unpatriotic about that. Even if Trump disappears, the America first agenda will continue. The people will ensure it happens. There’s no going back to the poverty, debt and hopelessness, particularly for the forgotten in the rust belt and midwest. How Could Anyone Vote Against This Economic Boom? Everyone has enemies and some of them have a lot of money. Without US spending, the world collapses and resentments will happen. The world is addicted to US cash, plain and simple. And like an addict being weaned off their designer drugs, there’s going to be some withdrawal events. Corporations are calling them supply chain disruptions. After Brexit, Europe is a neurotic mess and Asia is a self-aggrandized circus using communist government-backed play money. In contrast, the US is an oasis of sanity. You can find many quotes of economist’s opinions online. They cite interest rates, yield spreads, monetary policy, budget deficits, stimulus spending, manufacturing capacity and so much more of the predictable stats they say rule human existence. If old data is king, how did Trump become President? Who’s the First to Start These Avalanches? Rich people are different. They’re pessimistic. From the deck of their yachts, life can only get worse. They don’t think “I’ve got a great, secure job,” they think “my fortune’s in danger”. They don’t know why or how, they just feel something dark is near (thanks to the media). They can’t figure out whether to believe CNN or Fox. They can’t distinguish between US and the world. They get their money from everywhere and right now, they’re confused. In fact, they’re the ones who invested in Chinese and Mexican factories in the first place to maximize profits. Their score card is their bank account and they have little sympathy for Americans. That will change out of necessity. However, billionaires, millionaires, middle class investors can create quite an avalanche of panic-induced sell offs. This is what we should be most wary of. An avalanche only has to get started, then nature takes over. In the meantime, the latest jobs report reveals continuous, excellent 200k+ job growth each month and droves of people coming back into the workforce. Skill shortages are a true threat to US manufacturing revitalization. People will have to be trained. The education industry should enjoy their outlook. The unemployment rate rose to 4.0 percent in June from an 18-year low of 3.8 percent in May as 601,000 job seekers entered the labor force in a sign of confidence in the labor market — Reuters report. Employed persons rose highest levels in history. Job vacancies begin to rise as shortages begin to hit, and due to insufficient Americans to fill highly skilled vacancies. Good times for Millennials and for immigrants. One of Trump’s key advisors believes it’s US vs China. I think that’s wrong. But China’s communist, totalitarian government doesn’t deserve our confidence. They stole intellectual property and don’t seem to know when to stop gorging themselves in US consumerism. They erode our confidence. On the other hand, China may have a bone to pick. Their people and children slaved hard in those factories brought to life by American capitalists. Oh yes, what goes around, later comes back. President Trump has done a poor job of marketing/communicating the lasting value of his agenda to Americans. Polls show the people feel badly about their country, at a time when the US is healthy again and ready to lead the world. But when you’ve been sick for a while, you don’t just jump out of bed and join the party. It will take a while for Americans to regain their emotional health just as they lost it in the last 30 years. Americans are picking up the value of Trump’s agenda slowly though with their new higher paying jobs and new homes. It might be called osmosis and it will grow. Entrepreneurs in the US are actually getting taken seriously too. Yes, cars, solar panels, smartphone apps, robots, and computer chips can be made in the USA by companies managed by US executives (sorry India). There is real hope for the future of young Americans. Democrats are up all night strategizing how they can sabotage this incredible economic boom. They’re hoping some big tsunamis will make it back across the oceans to the US and wash Trump away. But Trump gets to decide how big those waves will be. And don’t think he doesn’t know. He’s increasingly hard nosed against his enemies. That’s practical. He’s a tactician assessing immediate feedback, not a strategist with a python intellectual grip, which is why his enemies are taking the higher road with a hope and a prayer. Their path is ill-advised though because that highway is congested with tens of millions of dejected Americans who thought Free Trade would be okay. Now they know they got sold. With Trump, the strategy is simple — support American business and everything else will fit in perfectly. So far, it’s working. The US economy is booming and all the fundamentals support an ongoing economic boom through 2024. Trump’s strategy is clear — protect American companies and markets so they can spawn. The housing market could be better, yet construction is okay and demand is certainly strong. This chart above shows the growth of the US housing market which will continue its climb in 2019. Notice how since 2013, the growth has been halting and uncertain, like steps up a mountain. There’s a wary, lack of confidence in home buyers, and fears of crashes in some cities, yet the line is rising nonetheless. This kind of growth is more resilient, aware of danger, ready for events, so it’s in control. It would take something massive to stop it’s forward thrust. 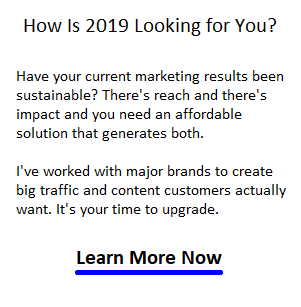 Check the predictions for the Los Angeles housing market, Atlanta Housing market, Florida housing market, New York housing market, San Francisco housing market, Boston housing market, Chicago Illinois housing market and in Philadelphia. All markets on a positive roll for 2019/2020. Now tack on the fact that home ownership is low, millennials are coming to family formation years, China trade tariffs and rules of origin rules on manufacturing keeping imports down, the coming reduced trade deficits, growing American wealth, and how strong the US dollar is and you have an incredibly solid economic outlook. The whole world is investing in the US pushing the dollar and stock markets higher. This is where you want to park your money and start a business. Gross domestic product growth estimates for the April-June period are as high as a 5% annualized rate, more than double the 2.0 percent pace logged in the first quarter — Reuters report. US GDP is growing strong at a projected 3%. Not China numbers but solid, steady, conservative, and sustainable growth rates. If it was 10% growth, it would get uncomfortable. But this is slow manageable growth without inflation. It’s rock solid. And labour productivity is hitting record heights in the last year. Risks are low, optimism is high, and success abounds. Even with the government shutdown, in this roaring economic environment, it’s difficult to be pessimistic. The last signals to be lit, will be the real estate economics signals. We’ll see them in summer 2019. There’s a full lineup of villains ready to stab the president in the back, and Democrat propaganda media channels but President Trump knows what they’re up to. The key here is a commitment to America First. The road back to China manufacturing is now full of pot holes and unlikely whatever the Democrats try. What’s the last word in the US economic revival? Momentum. The US economy is robust and growing and few will want to see this fantastic, business life-giving economic cycle end. As stock markets modernize and adjust, we’ll see better numbers from the stock market indexes including the DOW Nasdaq and S&P. Don’t be so hard on your grand kids! There are two ‘t’s in ‘tattooed’ by the way. Wish all the good news are true…….but I have some doubts…. ← Previous Post: When is the Best Time to Buy a House?